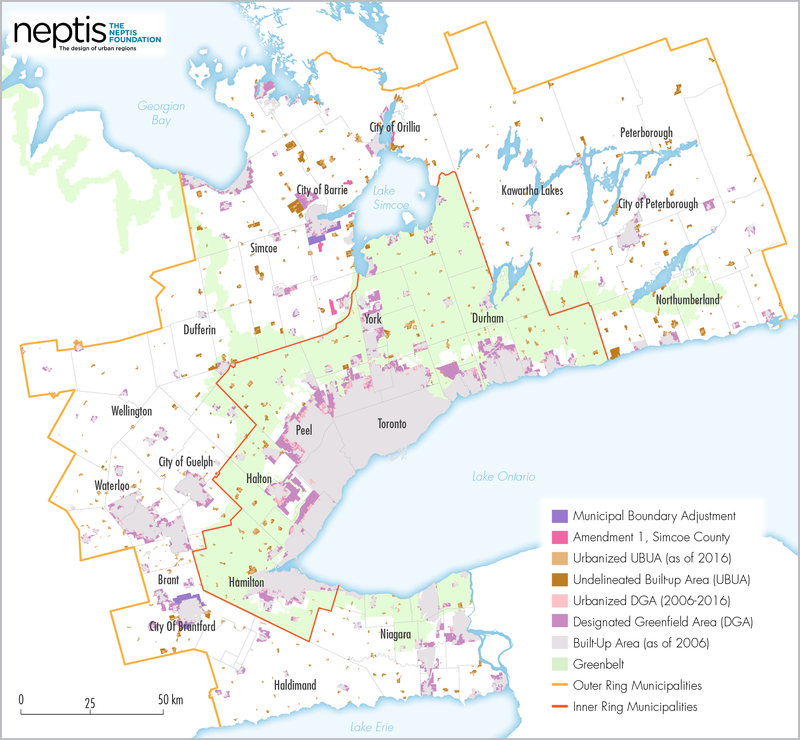 Neptis researchers have updated an estimate of the total supply of unbuilt land to accommodate housing and employment to 2031 and beyond across the Greater Golden Horseshoe as 125,560 hectares. The analysis involved using satellite imagery to identify and measure the 2016 urban footprint for the Greater Golden Horseshoe. 1. The Designated Greenfield Area: this land totals almost 103,200 hectares, fairly evenly split between the Inner Ring (Greater Toronto Hamilton Area) and the Outer Ring; about 87,440 hectares remains unbuilt. 2. The undelineated built-up area: 31,250 hectares of unbuilt land lie within the settlement boundaries of small towns, villages, and hamlets across the region. 3. Land added through Municipal Boundary Adjustments: More than 5,000 hectares have been added to the Cities of Barrie and Brantford as the result of boundary adjustments and annexation. 4. Land added in Amendment 1 to the Growth Plan: Almost 1,900 hectares of employment land have been added in Simcoe County. This represents a considerable supply of land for growth. In future, it will be important to monitor supply, particularly when further boundary adjustments or annexations are proposed.